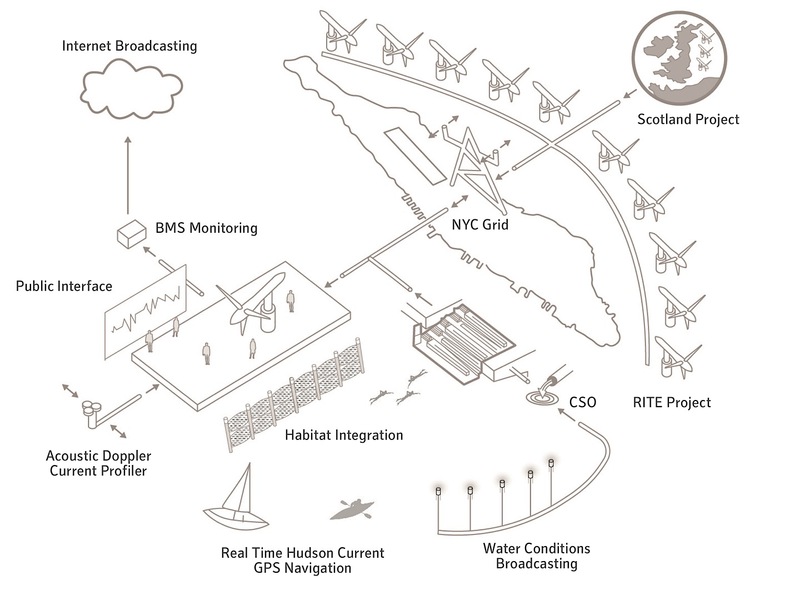 The idea of this project is to be of New York - to understanding the unique qualities of the Hudson River, Pier Infrastructure, and the city itself. 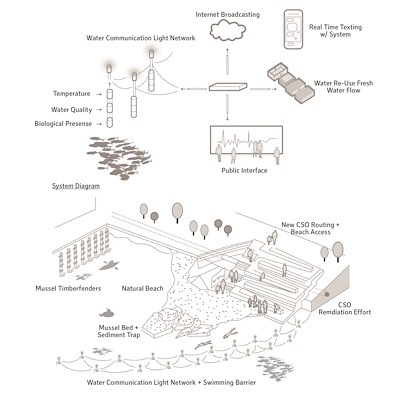 The goal is that by combining and harnessing these unique qualities we create an intervention that is efficient in its energy consumption, provides unexpected comforts to its public, and creates a new vibrant urban ecology. The Hudson River is unique in that it is an estuary river that flows in 2 directions creating strong ebb and flood currents that change the direction the river flows throughout the day for a 150 miles. This pier is unlike traditional piers as it's constructed of 3 huge concrete boxes sitting on the river bed forming a water break. This water break alters the flow of currents underneath the water surface and has the potential to greatly amplify the alternating ebb and flood currents to compress the current and increase the average 3 knots flow to approximately 6 knots. 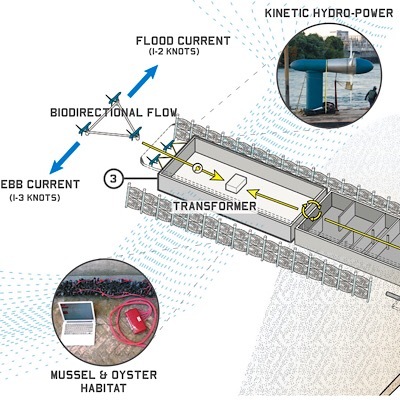 In this situation the hydro turbines would have the potential to generate more than enough energy for the building operations and would be connected directly to the grid and part of the emerging green power infrastructure turbine arrays in the East River and Long Island Sound. 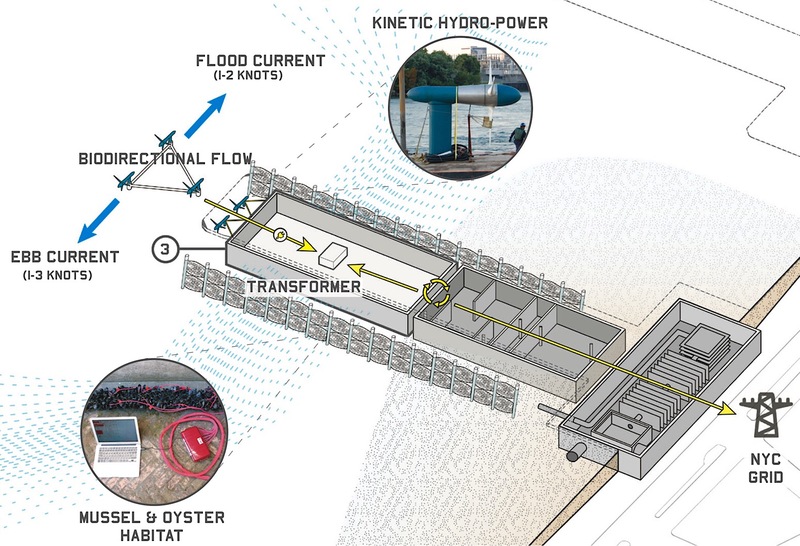 But what is more interesting is With the turbine technology in place we will have a heightened awareness of the river's movement and could monitor that knowledge, like real time traffic movements, transferring it to the building BMS systems and outputting it to public displays. 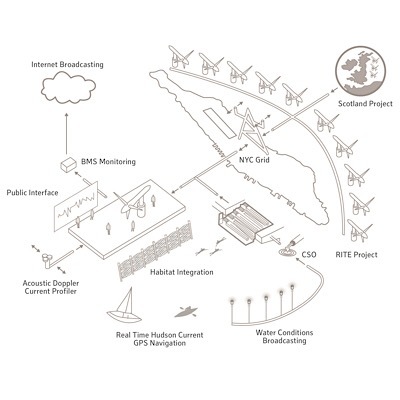 The turbine technology in this location is more publically accessible then the East River or Long Island sound, and can be a public display of emerging power sources of the 21st century, exposed and working with the movements of the local ecology. It's placement at the pier would result in an art program/gallery that is not about the river - but more 'of' the river - moving, changing, exposing the unseen pulse of the Hudson through digital analysis - making it physical in an un-curated way. 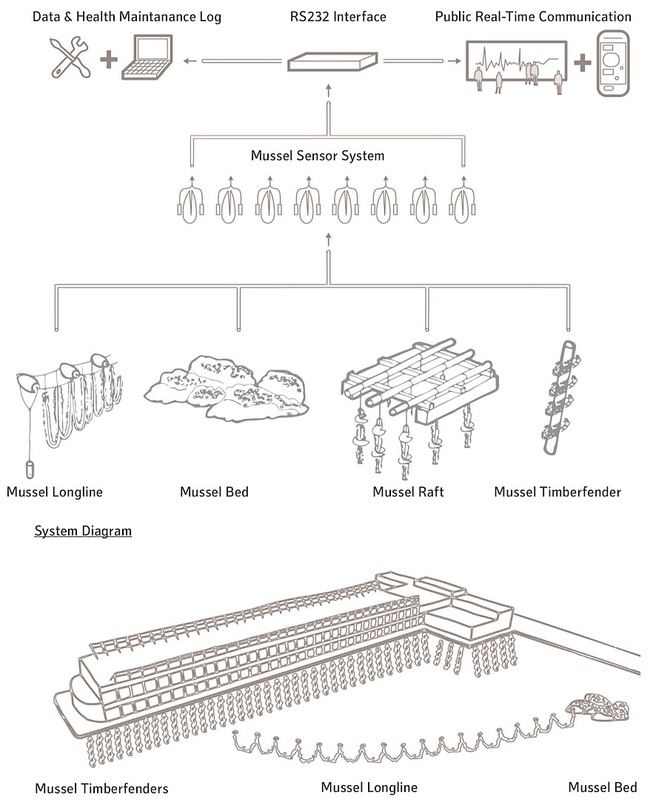 The pier structure has two levels in the caissons, the first level was for storage and the second was the concrete ballasts that were flooded to sink the structure to the river bed. Over the last century sediment has built up around the lower ballast cavity and the water is now under twelve feet of sediment. This water inside the ballasts is well insulated under the river bed and maintains a constant temperature year round. 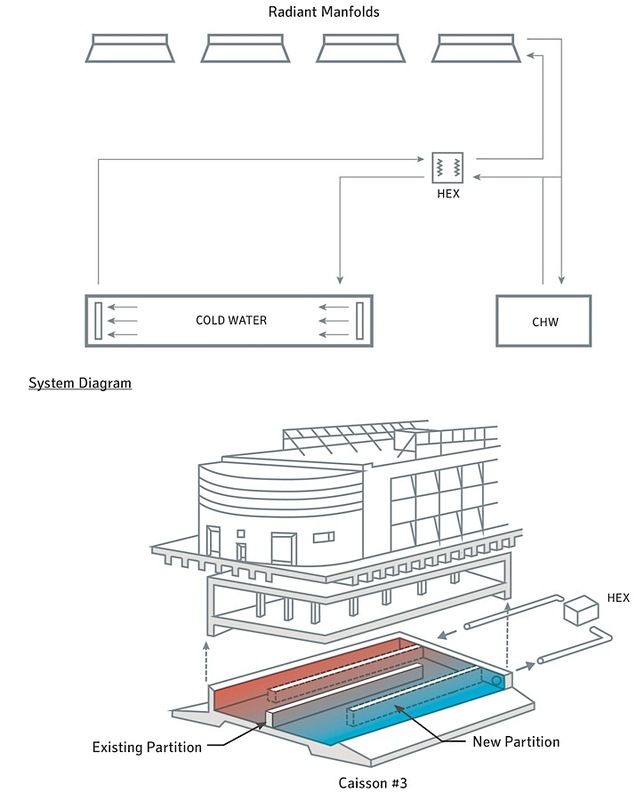 This insulated water source can be utilized as a heat sink (thermal battery) for the building mechanical cooling and heating systems similar to a geothermal well. 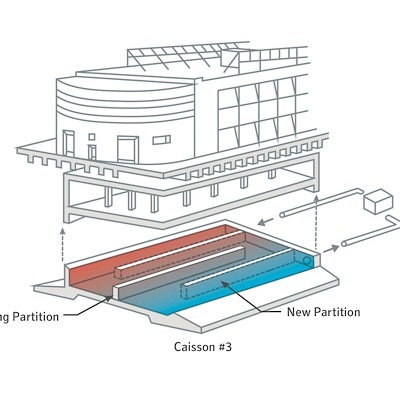 Furthermore, unlike traditional horizontal geothermal systems that effect the local soil or water environment, this thermal heat exchange is contained within the concrete enclosure of the caissons and does not influence the river bed temperatures while exchanging heat with the building operations. 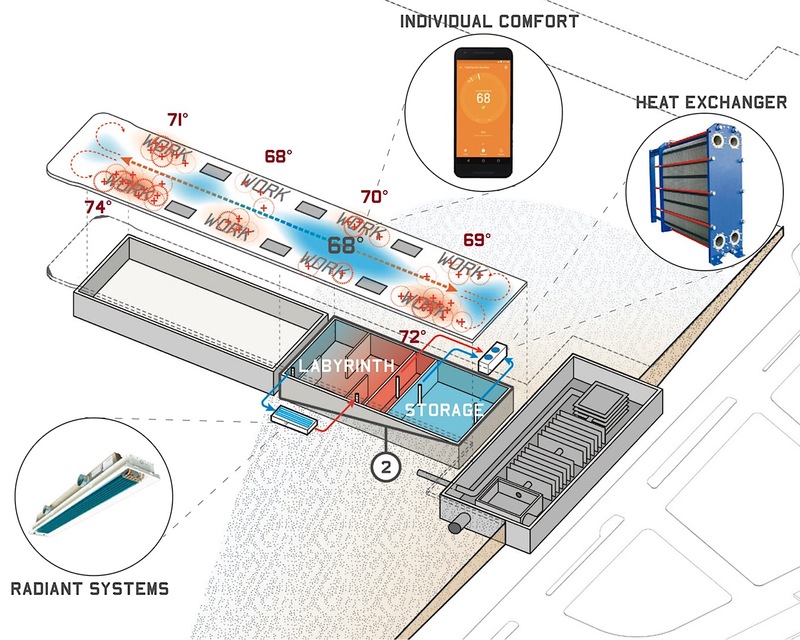 This heat exchange will greatly reduce the energy demand of the building operations and be a new benchmark for innovative green technologies incorporated into existing building conditions. The shoulder seasons are great in New York; the fall colors, festivals, food, and beer are part of the culture of the city. 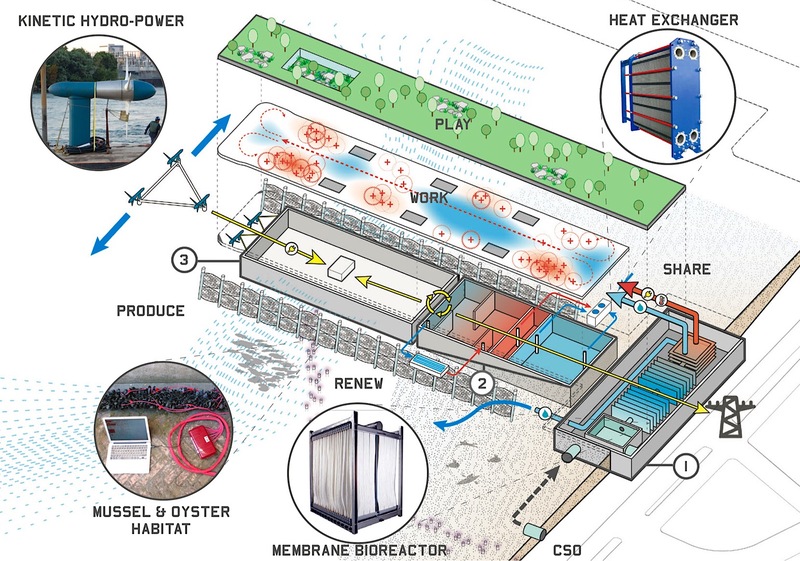 The question for us became how could we do more with the local heat exchanges of the caisson and integrate them with the program to amplify the outdoor experiences to create a place people would socialize longer at the pier, creating an outdoor micro climate. 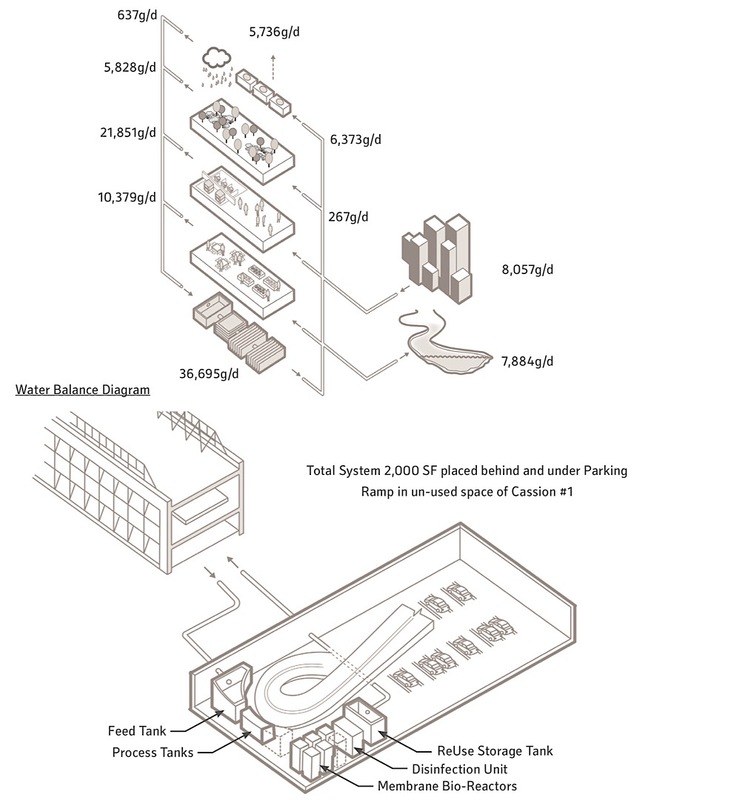 We often overlook the potential of our own waste streams within building operations. 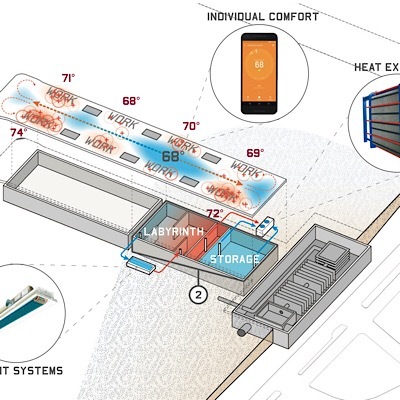 If we look at the radiant systems we can utilize the tempered water that is still warm after use within the offices and prior to sending it back to the heat sink caissons run it to the patio spaces to adjust slightly the surface temperatures of those spaces. If we combine this slight warming of the exterior patio walking surface with organic waste, specifically the vegetable cooking oils of the building cafe program, we can create hot spots of comfort through biofuels similar to more traditional gas fired heaters that will draw people outside to enjoy the season. 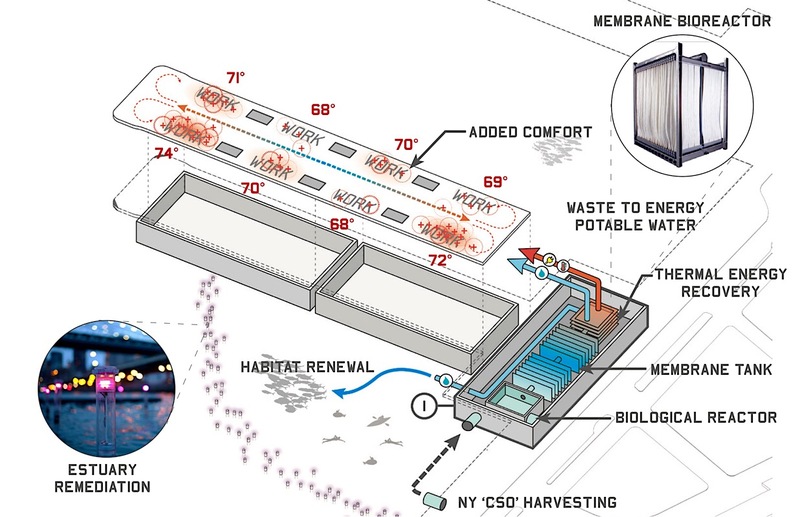 The truth is fall and spring people are dying to be outside, but often it's just a little too brisk to be comfortable - and we can change that with our waste streams. New York City has one of the oldest water infrastructural network in the country and world. It relies on the use of a combined storm water and sewer overflow system (CSO) that pumps waste into the river when the centralized treatment plants can't process the water load during times of heavy rain or melting snow. We thought, could the pier's unique structure adjacent to these CSOs address these concerns? What is interesting about the third concrete structure is that it's quite different than the other two sections and is made of an aggregate of concrete chambers networked closely together. These concrete chambers are perfectly sized to insert emerging black water treatment membrane bio-reactor infrastructure similar to the systems installed at Battery Park City. 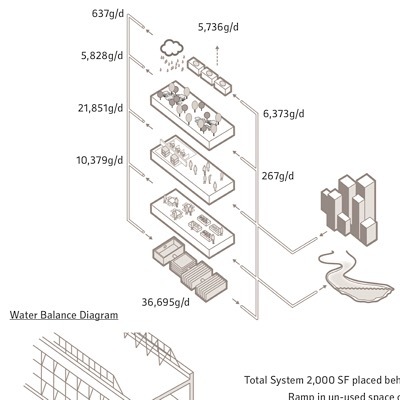 This equipment can be used to facilitate the new program's water reuse initiatives, but more importantly it could absorb CSO overflow at times of excess rain or snow from the site. 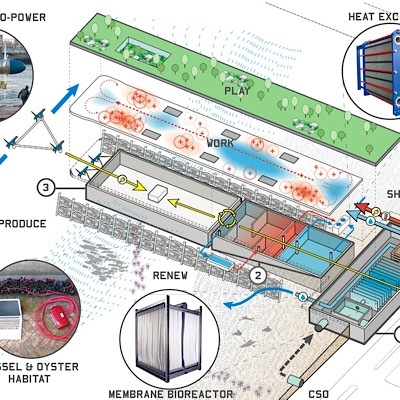 The CSO mitigation would create a yearly water reservoir of for the landscape, as well as remediate the brackish water around the pier, while the heat created by the microbes from the bioreactors processing the water could contribute to energy recovery for the HVAC systems, adding additional comfort to the interior spaces. There has been a lot of progress over the last two decades with cleaning up the Hudson River and it has changed from being heavily polluted to nearly swimmable. 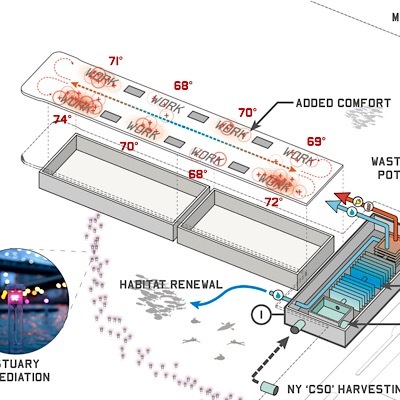 If the CSO located at pier is redirected into the building's black water re-use infrastructure, it is possible that the shore along pier could be a swimmable beachfront. This infrastructural strategy would expedite the ecological remediation of the local shore line and help to facilitate the habitat renewal of the oyster beds that are part of the existing timberfender infrastructure. 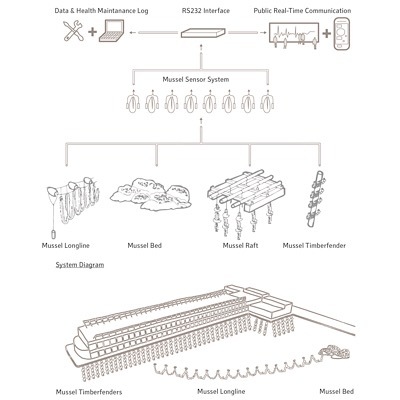 The oyster beds will have an integrated monitoring system for harvesting which could also be a communication system that broadcasts in real time the water quality conditions to the public. With this combination, we could create the first beach environment to be placed back into Manhattan - adding to the recreation / health atmosphere of West Side Park and becoming a huge public draw during the hot summer months. 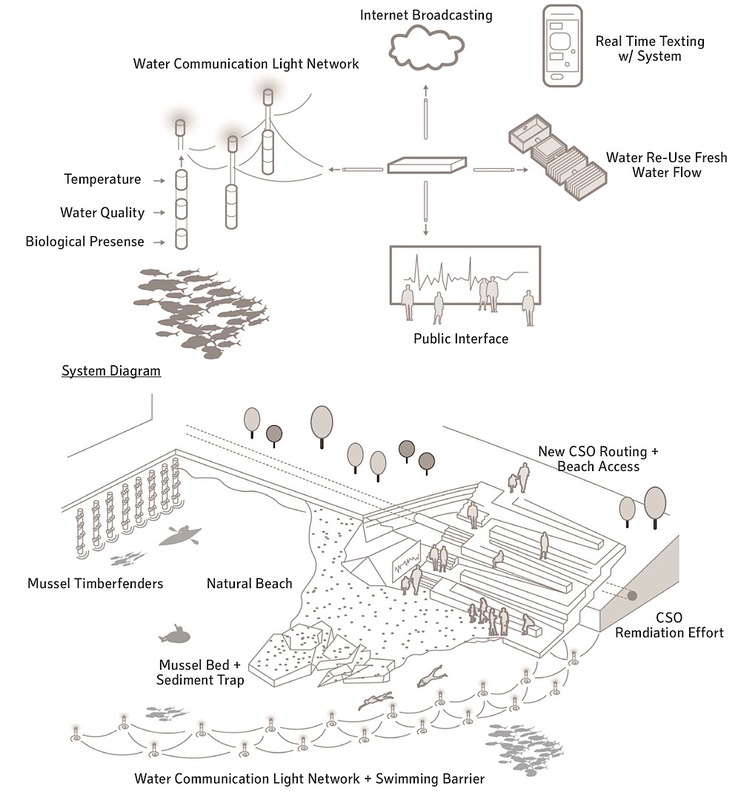 In the end, the pier becomes a destination to work, learn, eat, and enjoy the real potential of integrating social, infrastructural, and ecological systems together in a way that creates mutually beneficial relationships that improve the overall health of the constructed environment and sets a new benchmark for Urban Ecology.